A new wave of foreign direct investment has swept sub-Saharan African countries, with inflows becoming more diversified both geographically and sectorally. This column presents an analysis that shows a high degree of complementarity between involvement in global value chains and FDI. Policies supporting the entry and upgrading of countries in such chains – especially via a strong institutional setting and a well-educated labour force – can help maximise the spillovers from foreign investment. In the last 15 years, developing countries have been affected by two major trends: an upsurge in foreign direct investment (FDI), and their increasing participation in the process of production fragmentation. The new wave of FDI has swept sub-Saharan African (SSA) countries, where inflows are becoming more diversified, both geographically (thanks to emerging economies) and sectorally, shifting from exclusive concentration on extractive sectors to light manufacturing and services (Gorg et al. 2013, Sutton 2016). And through their participation in global value chains (GVCs), firms in developing countries have become fully qualified participants in the global market, specialising in specific stages of the production process, and exploiting their comparative advantages without having to develop all the capabilities needed along the whole chain (Baldwin 2014, Taglioni and Winkler 2016, World Bank 2017). The opportunity of joining the production chain, just in one or few specific stages, is of particular relevance in countries that have a limited manufacturing base, such as many SSA countries, where participation in the global market through GVCs may represent a ‘golden opportunity’ to promote inclusive growth (AfDB et al. 2014, IMF 2015, World Bank 2017). In a recent paper (Amendolagine et al. 2017), we show that the degree of involvement in GVCs could be a novel dimension to explain the potential spillover effects of FDI, via an increase in the demand for local inputs. An intensive participation in GVCs exposes local firms to the requirements of international markets, to a more sophisticated demand, and to learning opportunities, thanks to knowledge and technology transfers within the value chain from global leaders to local suppliers (Farole and Winkler 2014). The empirical analysis is based on firm-level data, and matches the African Investor Survey (AIS), undertaken in 19 SSA countries, and the Vietnam Industrial Survey (VIS)1, with the two indicators of GVC involvement measured in country-sector pairs to assess whether the degree and modalities of involvement in GVCs matter for the local sourcing of intermediate products by foreign investors. A joint analysis of SSA countries and Vietnam allows for the comparison of a region relatively less attractive to foreign manufacturing investments with a country recently assuming a central role in the rapid expansion of the global fragmentation of production. We calculate two indicators of GVC participation and position at the host country-sector level.2 GVC participation is measured as the sum of foreign value added (FVA) and indirect domestic value added (IVA, e.g. the value added embodied in intermediates re-exported to third countries), divided by total sector-country exports. The second indicator measures the relative position of the sector-country pair within the GVCs, calculated as the log-difference between the upstream (IVA) and the downstream component (FVA) of the GVC participation index. Thus, positive values indicate an upstream specialisation in GVC phases of the production process far from the final demand (e.g. production of intermediates products used by other countries in their exports) and negative ones denote downstream specialisation in phases close to the final demand (e.g. use of intermediates to produce final goods for exports). Figure 1 shows the indicators of GVC participation and position across SSA countries and Vietnam. Many SSA countries are characterised, at the same time, by an upstream specialisation and a relatively low level of GVC participation, since they are involved in the very initial stages of the manufacturing transformation of inputs then exported for further processing. 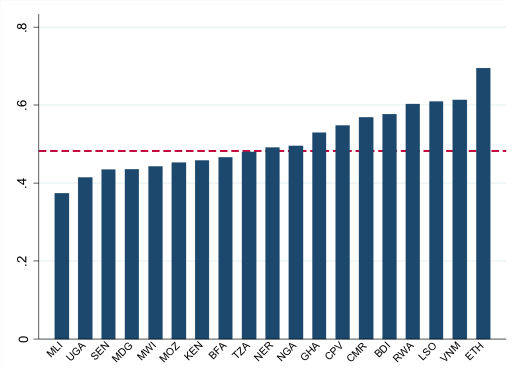 On the other hand, countries with a relatively high participation in GVCs (e.g. Ethiopia, Lesotho, and Vietnam) are generally characterised by a more downstream position (see also Kummritz and Quast 2017). Notes: The two indicators are calculated at the country level in 2010. See Ameldolagine et al. (2017) for a precise definition of both indicators. The red line represents the average value in developing countries, defined as low income and lower-middle income countries according to the World Bank classification. Source: Our elaborations on Eora Multi Region Input-Output database. 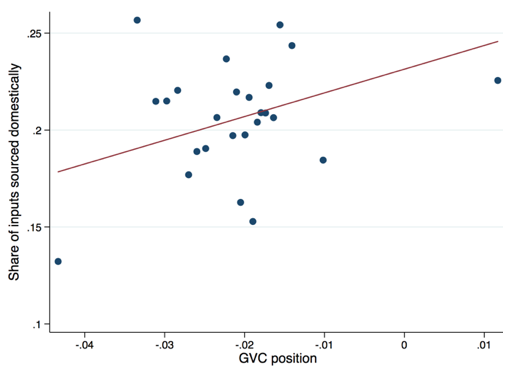 Notes: The charts show binned scatterplots of the share of inputs sourced domestically by foreign investors against GCV participation (panel a) and GVC position (panel b). See Ameldolagine et al. (2017) for a precise definition of both indicators. To generate the binned scatterplot, starting from the regression sample (See Ameldolagine et al. (2017), Table 3, column 1), the GVC indicators are grouped into 25 equal-sized bins, then the chart plots, for each bin, the mean of the GVC indicator and the share of inputs sourced domestically within each bin. 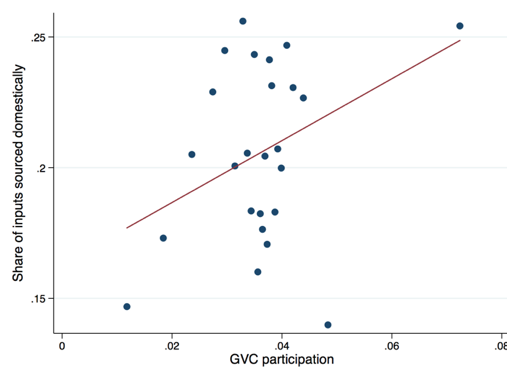 These findings are not exclusively driven by the relatively high participation of Vietnam in GVCs, as in SSA countries the relevance of GVC participation, albeit weaker, remains significant. Furthermore, the relationship between GVC involvement and local sourcing is stronger in countries with stronger rule of law and higher education spending, supporting the view that a good institutional environment and the availability of a relatively well-trained labour force are important factors in attracting foreign investors, especially if the aim is to create local linkages with domestic suppliers. 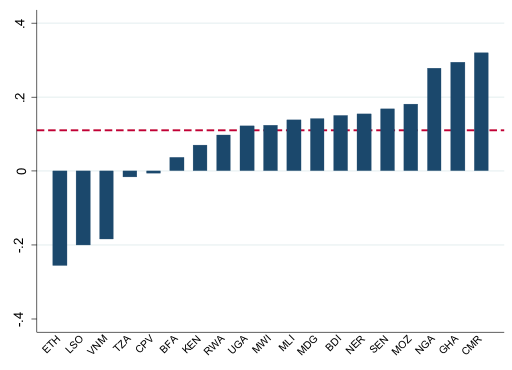 Our analysis shows a high degree of complementarity between GVCs and FDI, and suggests that policies providing support to the entry and upgrading of countries in GVCs can offer an additional advantage in maximising the potential spillovers from FDI. Improving institutions and investing in education can magnify the positive relationship between GVC involvement and FDI spillovers. Yet, achieving high levels of GVC involvement is not a guarantee of attracting FDI with high sourcing potential. Countries and sectors with high GVC involvement may attract footloose investments, should they offer foreign investors low cost inputs and other export incentives. This is a common case in some SSA countries, specialised in the textiles industry, and even in Vietnam, which is highly involved in labour-intensive stages of production. Policies supporting stronger interactions with local suppliers, their upgrading and the raising of the local content, may help to avoid such occurrences. In this respect, our findings support recent policy efforts in some SSA countries (i.e. Ghana, Nigeria, Mozambique, Ethiopia, and Rwanda) that aim to foster the use of local inputs by foreign investors, by improving infrastructures and boosting education and training standards to build a skilled labour force and to meet the more sophisticated demand of global markets (AfDB et al. 2014, Gereffi and Luo 2014). Authors’ note: The views expressed in this article are those of the authors and should not be attributed to the IMF, its Executive Board, or its management. AfDB, OECD, and UNDP (2014), African Economic Outlook, Paris: OECD. Amendolagine, V, A F Presbitero, R Rabellotti, M Sanfilippo, and A Seric (2017), “FDI, Global Value Chains, and Local Sourcing in Developing Countries”, IMF working paper no. 284. Baldwin, R (2014), “Trade and Industrialization after Globalization's Second Unbundling: How Building and Joining a Supply Chain Are Different and Why It Matters”, NBER working paper no. 17716. Farole, T, and D Winkler (2014), Making Foreign Direct Investment Work for Sub-Saharan Africa, Local Spillovers and Competitiveness in Global Value Chains, Washington, DC: World Bank. Gereffi G, and X Luo (2014), “Risks and opportunities of participation in global value chains”, VoxEU.org, 14 June. Görg, H, C Krieger-Boden, and A Seric (2013), “With a little help from my friends – FDI in Africa”, VoxEU.org, 10 December. IMF (2015), Regional Economic Outlook: Sub-Saharan Africa, Washington, DC. Kummritz, V, and B Quast (2017), “Global value chains in developing economies”, VoxEU.org, 25 February. Sutton, J (2014), “Gains from the Natural Gas: Local Content and Tanzania’s Industrial Development”, The Seventh Gilman Rutihinda Memorial Lecture, Bank of Tanzania. Sutton, J (2016), “Harnessing FDI in Africa”, VoxEU.org. Taglioni, D, and D, Winkler (2016), Making Global Value Chains Work for Development, Washington, DC: The World Bank. UNIDO (2012a), Africa Investor Report 2011: Towards Evidence-based Investment Promotion Strategies, Vienna: UNIDO. World Bank (2017), Global Value Chain Development Report: Measuring and Analyzing the Impact of GVCs on Economic Development, Washington, DC: The World Bank. The surveys provide detailed information on the general characteristics of foreign investors, including their ownership structure, country of origin, motivation for investing, location determinants, linkages to the local producers, and assistance received by institutions in the host countries. For a detailed description of the two surveys, see UNIDO (2012a) and UNIDO (2012b). Additional information on both surveys is also available through the UNIDO Investment Monitoring. Notwithstanding some well-known concerns about missing data filled through optimisation procedures, we use the Eora Multi Region Input-Output database to measure GVC involvement, since it is the only Input-Output database with information on SSA countries. Two cases in point are the Ahafo Linkage programme in Ghana in the gold industry reported by Farole and Winkler (2014) and the local content programme established by the Government of Tanzania, following the discovery of gas (Sutton 2014).